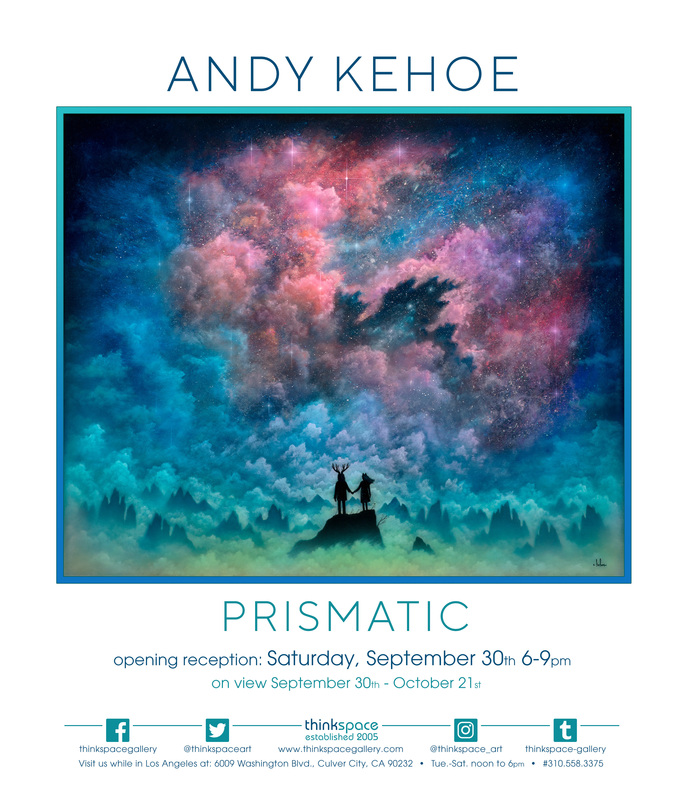 Thinkspace is pleased to present PRISMATIC, featuring new works by Pittsburg-based artist Andy Kehoe. A teller of tall tales, Kehoe’s work is known for its fantastical worlds and antlered creatures all fossilized beneath multiple laminae of cured resin. His mixed-media paintings combine a nostalgic sensibility, reminiscent of classic children’s storybooks and fairy tales, with an imaginative litheness and penchant for the experimental. His unique technique, a method of combining resin with oil paint and building surfaces through multilayered pours, bridges the sculptural with the planar through a dimensional, albeit undetectable build-up of materials. Though an intrinsic aspect of the work, the glassy optical effect, and three-dimensional depth are by-products of materiality and process rather than an end point in and of itself. Kehoe’s playful hinterland offers a window onto an unchartered multiverse where an overwhelming sense of the immeasurable reigns. As though suspended beneath pools of glass, Kehoe’s polychromatic resin works depict solitary or companioned creatures in fields of suffused color. Like living worlds, the atmospheres ebb and flow beneath the surfaces with swollen skies and luminescent harbingers. The natural world has long been a source of inspiration to the artist and a primary theme in his poetically charged works. Drawing from a similar Romantic philosophy as that expounded in the late 18th to mid 19th Centuries, Kehoe looks to the vastness of nature as a poetic trope for both the connectivity and spiritual alienation of the human psyche. Just as the Romantics called for a return to nature in reaction to the commodification of the human soul, so too does Kehoe look to its vastness as a source of multiplicity, creative possibility, and endless gradation. Combining the mysticism of something vaguely shamanic with the playful strangeness of fantasy, Kehoe’s mythic, liminal world is both meditative and spectral. Kehoe often incorporates sculpted elements made of polymer clay into his works, submerging the forms beneath the strata of pigmented layers. An element of interactive accident comes into play as well, as he allows his materials to combine organically under controlled circumstances. This productively tangential quality of the resin materially conveys the emotional and psychological breadth of the incalculable: a theme that underwrites much of Kehoe’s storytelling. PRISMATIC is a body of work that speaks to both the freedom and fear of the unknown. Through the prisms of fantasy and imagination, Kehoe considers the variegated nature of mixed perceptions that shape our endless versions of experience. By creating works that speak to both the hugeness of the surrounding world and the smallness of the individual protagonists grappling with their versions of reality within it, he uses fantasy to tap into the metaphysical. 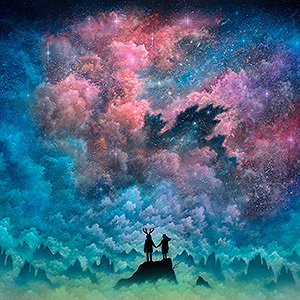 So much is unknown, and while this multifaceted cast on reality can be both freeing and expansive, it also inspires dread, isolation, and anxiety. This allegorical universe of Kehoe’s is a strange place of reckoning, where the solitary self and the fragile comforts of companionship are forced to take stock of their fragility and impermanence.